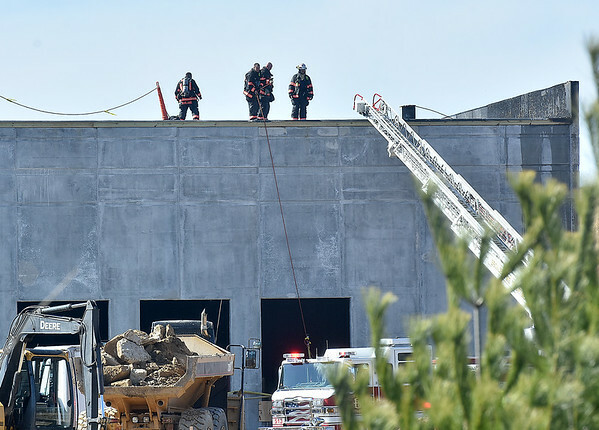 (Brad Davis/The Register-Herald) Beckley firefighters put out the last remnants of a fire that broke out briefly on the roof of a building under construction in the Pinecrest Industrial Park Friday afternoon. Construction workers on scene said they were installing roofing materials when static electricity ignited some of the material, said to be an adhesive, used in the process. Workers on scene reported no injuries. The building will be the new Dr. Pepper location when completed, which is currently located on Robert C. Byrd drive in Prosperity.